These Signals Lights or Turn Signals or Clear Lenses are transparent with a fine chrome trim. They are combined with an orange insert. From 1973–1977 of classic car/truck Cherokee, Wagoneer, Gladiator years, the chrome border was removed. Currently, we are the only manufacturer / supplier for these. Our reproduction of turn signal lens is absolutely faithful to the original model of Wagoneer, Cherokee and Gladiator and not fit for the Grand Wagoneer. 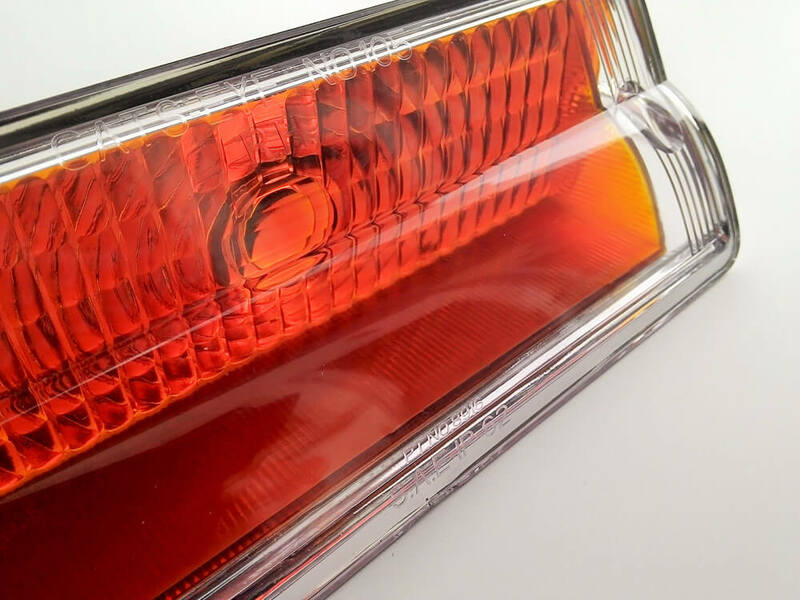 Our reproduction of turn signals lights for Wagoneer, Cherokee, Cherokee and Gladiator integrates a chrome border in the same way as with the original part. This border is integrated to the inside of the lenses. Not being able to apply chrome to ABS, even in a partial manner, we have used a complex process that involves setting the aluminum in a vacuum (vacuum ION coating) in four steps. For a quality kit, we have decided to cut custom mounting joints, made using cork/rubber, whose color is almost identical to the original. These joints have a 0.5mm thickness and are interchangeable. They are placed between the lenses and the aluminium case. The biggest problem on this year of Wagoneer or Cherokee is the broken or missing gasket. In this case, the water comes into the housing and aluminium. To provide quality parts and to avoid rusty water stains on the lenses, we replaced the original 10/32 3/4" chromed steel screws by thus ensuring that there will be no rust marks. The biggest problem on this year of Wagoneer or Cherokee is that the original screws are just chromed; in this case they come year by year rusted and the rust mark the lens and that a big issues. Clic to run the video. These lenses are only compatible with the older aluminium 64–76 lens housing and not fit for Last Wagoneer, Jeeps Grand Wagoneers, Jeep Grand Wagonne, Jeep Grand Cherokee or Cherokee (from 76). The new versions (present on Last Wagoneer or Cherokee) of the OEM plastic housing are slightly different, as the space between the screws is different. In addition, the rear shape of the lens is different. Check the video to learn how to replace your poor light parking. A pair of transparent lenses faithful to the original and of excellent quality, including all necessary hardware, for only $35. For your Jeep Wagoneer, Jeep Cherokee or Jeep Gladiator. Our lenses are manufactured by injection molding. The plastic material (ABS – acrylonitrile-butadienestyrene) is softened, injected into a mold and cooled. These are injection-molded in many manufactured products: automotive, household appliances, computer equipment, furniture, etc. Using a mold is the only one way to obtain an exact fit of the parts produced even after more than 1,000 items. That is the reason why my part absolutely fits with your Wagoneer, Cherokee or Gladiator. Our products are developed in #Switzerland, with some steps such as the manufacture of the mold and the pressing of the final parts outsourced to China. Chrome plating, packaging and quality control are all carried out in Switzerland, thus ensuring perfect quality. The parts are inspected one by one before each shipment. "I also have a classic vehicle #Jeep Wagoneer, Cherokee or Gladiator, my Parking light or Turn Signal clear lenses are in bad shape. I have been looking for some for a long time, this product interests me very much." You prefer to use eBay ? No problem, we are present in a US national market store on eBay. 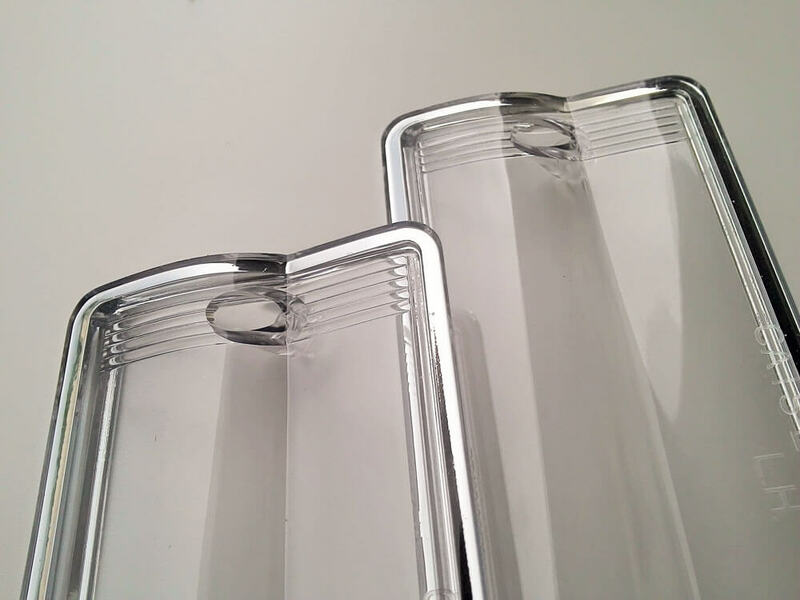 After the success of the first commercialized product: Parking Light Clear Lenses, I started a new product project to rebuild bumper stripes or nerfs for Grand Wagoneer 84–91. This project is currently in production, for a delivery to the market September 2017.